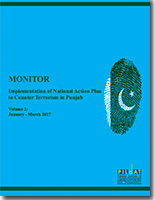 The 20-point National Action Plan to Counter Terrorism adopted by an All Parties Conference chaired by the Prime Minister of Pakistan on January 2, 2015 serves as the landmark consensus blue print for combatting terrorism and violent extremism in Pakistan. The 20-point NAP has been described, both by the civil and military leadership, as the most important road map for the struggle against terrorism in the country. The NAP is also significant because it has the rare consensus of otherwise bitterly opposed political forces besides the civil-military agreement. Both Civil and Military leaderships have repeatedly expressed their strong commitment to implement the plan in letter and spirit.